Egypt's Al-Azhar University: Moderation or Dissimulation? While Al-Azhar's informational campaign aims to promote "moderate" Islam, reinforce the values of citizenship and coexistence among Egyptians, and counter "deviant fatwas," a recent study reveals that senior officials at Al-Azhar are still defending and promoting school curricula that contradict tolerance and acceptance of Egypt's Coptic Christian minority. Al-Azhar officials, it turned out, removed the proposed content encouraging tolerance and acceptance of Christians from the school curricula, and the official who proposed that curricular "reform" was fired. Why are Al-Azhar's leaders not fully cooperating with Egyptian President Abdel Fattah el-Sisi? Factors include their extremist Islamic faith, and uncertainty regarding their public image and their popularity if they yield to Sisi's demands. These reservations seem especially charged in the context of rivalries for religious leadership in Egypt, and signs of support for Al Azhar from the parliament, the media and the public. Possibly even more persuasive is the fear of gradually losing all power and the ability to use taqiyyah when needed if they yield to Sisi's demands. Al-Azhar University seemed to have either an ambivalent attitude or a two-faced, taqiyah [dissimulation] one regarding tolerance towards Christians in particular and Islamic moderation in general, according to a report, "Two Faces Of Egypt's Al-Azhar: Promoting Goodwill, Tolerance Towards Christians In Informational Holiday Campaign – But Refusing To Do The Same In Its School Curricula," disclosed by the Middle East Media Research Institute (MEMRI). 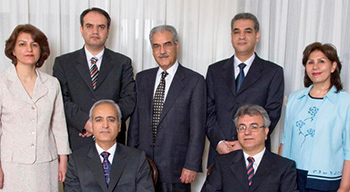 While Al-Azhar's informational campaign, "Sharing the Homeland," aims to promote "moderate" Islam, reinforce the values of citizenship and coexistence among Egyptians, and counter "deviant fatwas," a recent study published in El-Watan News reveals that senior officials at Al-Azhar are still defending and promoting school curricula that contradict tolerance and acceptance of Egypt's Coptic Christian minority. Al-Azhar officials, it turned out, removed the proposed content encouraging tolerance and acceptance of Christians from the school curricula, and the official who proposed that curricular "reform" was fired. This example of Al-Azhar's inconsistency and seemingly internal conflict adds to the tension in the relationship between Egypt's President Abdel Fattah el-Sisi and Al-Azhar's Grand Imam Sheikh Ahmed Al-Tayeb over the university's apparent refusal to comply with the president's calls for Islamic reform and moderation. In January 2017, in the context of Sisi calling for banning oral divorce (a demand Al-Azhar refused), he publicly said to Al-Tayeb, "You wear me out". While the remark was made jokingly, it revealed underlying tensions in their relationship and Sisi's frustration with Al-Azhar's unyieldingness to reform. On the other side, Al-Azhar leaders evidently find many aspects of the proposed reforms unacceptable. It seems that the Presidency and Al-Azhar institutions are testing each other's limits, the attitudes of the public and the intellectuals, and possibly the potential threat to the authority of the clergy, as well. In April 2017, MP Mohamed Abu Hamid, a known supporter of Sisi, proposed a change to the 1961 Al-Azhar Law that would limit the authority of both the institution and its head, and increase the government's control of both. For example, Section 5 of the bill states that if two-thirds of the members of Al-Azhar's Council of Senior Scholars (ACSS) think that the Grand Imam is not fulfilling his role appropriately, he is to be sent before an investigative committee comprising seven of the council's leading members. This committee has the power to warn the Grand Imam, reprimand him, or "revoke his authority." Section 8 authorizes the president to appoint the imam and preacher of Al-Azhar's mosque from among three candidates that are to be put forward by ACSS and Al-Azhar's Academy of Islamic Research. It later became clear, however, that there was support in parliament for Sheikh Al-Tayeb. Several MPs criticized the bill and those who had previously supported the bill withdrew their support and said that it harmed the status of the Al-Azhar. MP Osama Sharshar submitted a memorandum, signed by the majority of the 406 MPs, to the Speaker of the House of Representatives, Ali Abdel Aal, demanding that the bill be shelved and claiming that it was aimed at harming one of the institutions of Egyptian society. "Al-Azhar is a red line" much like the military, Sharshar said. On May 8, 2017, the bill was shelved and the day after that, a delegation of MPs met with Sheikh Al-Tayeb, who thanked them for their opposition to the bill and warned that any affront to Al-Azhar was a blow to Egypt's position as "defender of Islam" and its "moderation." 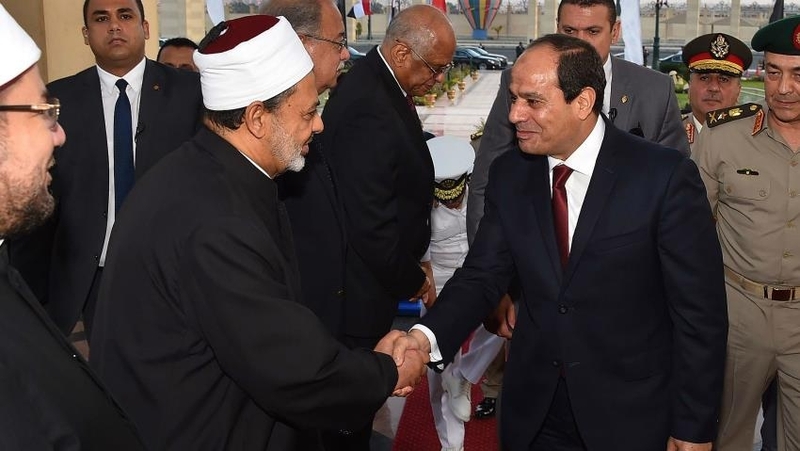 Why are Al-Azhar's leaders not fully cooperating with the strongman, President Sisi? Factors include their extremist Islamic faith, and uncertainty regarding their public image and their popularity if they yield to Sisi's demands. These reservations seem especially charged in the context of rivalries for religious leadership in Egypt, and signs of support for Al-Azhar from the parliament, the media and the public. Possibly even more persuasive is the fear of gradually losing all power and the ability to use taqiyyah when needed if they yield to Sisi's demands. Surely such mental gymnastics by Al-Azhar University deserve formal global recognition in the form of a Nobel prize...for duplicity. As a Copt who has lived in America for 47 years, I am offended when I read "tolerance" or "acceptance" of the Christians by the Muslims in Egypt. The writer has unfortunately forgotten that Christians are the original owners of Egypt and that they preceded the Muslim invaders and that most Egyptian Muslims had Christian grandparents before they were coerced to adopt Islam. All Autocratic or Theocratic regimes end up committing suicide. Initially, ignorant individuals endure the suffering for their rulers, tsars, sultans emperors or "senior scholars" took ALL the credit. While the thirty year religious war, between Catholics and Protestants, was ravaging Europe, Egypt was welcoming of ALL religions and ethnic groups without discrimination. This made it the haven of entrepreneurs, learners, tourists and traders. If history is a guide, the current religious fanaticism in Egypt will die when the young discovers that they sacrificed everything and got nothing in return. They were used by the "senior scholars." President Sisi, bless him, may be asking Al Azhar scholars to do the impossible: derive a non-Sunni form of Islam which is still Sunni Islam. Islamic law and the Koran stands in the way of any reformation or moderation. Islam is Islam take it or leave it. But to try to teach something that is contrary to Islamic basic principles does not make sense. Bad news for all the so called reformers: If you take out all the negative, violent and us against them rhetoric in Islam, there is very little left and certainly unsustainable to stand as a religion on its own. I urge all clear thinking and freedom loving people to look at what Great Britain has allowed to happen in their once great country. Islam's influence is everywhere in Great Britain and is increasing every day. I refer to the number of Muslim mayors and MP's in Britain and the increasingly high numbers of Muslim ghettos in their cities. It appears Britain has completely lost it's way and perhaps their minds! The people of Britain should be very afraid.